Download and install the latest preview version of SDR-Radio.com. As usual download and extract the latest Zadig drivers and install them for your RTL2832U stick. Remember you need the 7Zip software to extract Zadig. Download and extract the .dll files from AA5SH website. Open the folder SDR-RADIO.com.RTLUSB that you extracted. There will be two folders 32bit and 64bit. Open the folder that matches your Windows version (32bit or 64bit). Copy the three .dll files contained in the folder to the SDR-RADIO-PRO.com folder on your PC (usually found in your Program Files folder). Click on the Radio Button near the top of the console. Add a radio definition. Be sure to change the radio type in the drop down menu to RTL SDR (USB). Click the Search button and if everything is installed correctly SDR-Radio.com will find the RTL2832U. Click OK and your stick should show up in the radio definitions list. You can also select the sample rate at this point if you want to from the drop down in the radio definitions box. Highlight the RTL2832U device in the radio definitions list and click start. You RTL2832U should now be running with the RTL2832U stick. You may want to adjust the RF gain setting from the RF menu at the top of the SDRConsole screen. You also want to click on the More button at the top of the SDRConsole and set the PPM offset to have SDR-Radio to more accurately display the tuning value from the RTL2832U stick. Nice work! Everything appears to work except I cannot get any sound. The speakers are not muted. SDR# works fine with speakers. Any suggestions? I’ve checkedand I couldn’t find out what was keepng the noise from the speakers. I’ve ordered a dongle from Ebay, £8 including posting! from what my friend G1VVP tells me i’ve resigned myself to the fact that it will overload at home. but i do a lot of dxpeditioning and i don’t feel so anxious about taking an £8 radio and old laptop abroad as i would with a £3000 comms rx! and if its still unusable – what the heck its only £8! ok, perhaps i am a idiot. Click on the Radio Button near the top of the console. Add a radio definition. i got SDR-radio 1.5 build 1058 here…. ok, is there a option to set the osc offset ? 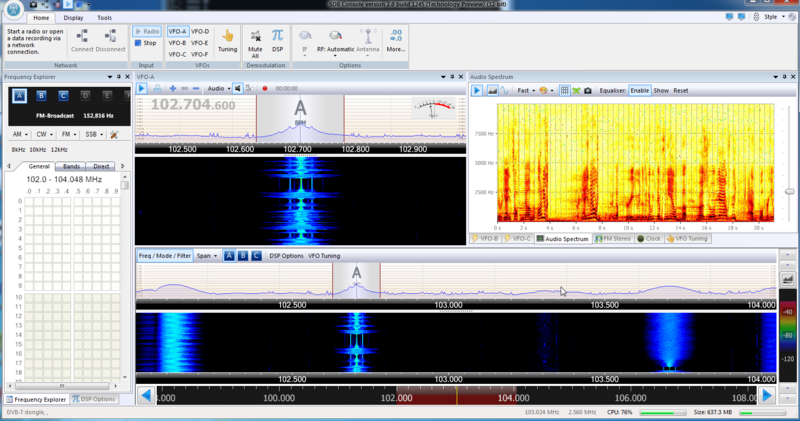 wel, on sdrsharp it is no isue, but on sdr-radio i cant (yet) find it. any way, i got it working ,works nice…. Got sdrsharp working with the dongel, wanted to try Simon’s SDR-Radio. Got the dll’s from AA5SH website just fine. Must be getting old but no download link on SDR-Radio.com for any version. Any one have a link? Try http://v2.sdr-radio.com under the Previews tab. Nice demo (2.0 build 1361 64) in an alpha state but not more. Consumes huge amounts of memory, sound card not really selectable, hang-ups, multi VFO option not working, frequency not shown correctly, grafical window overlapping problems. When I use the rtl2832u+r820t with the v2 console, it lags up the computer and runs extremely slow and the audio is choppy, in and out. Other software allows you to adjust the audio sampling rate and speed of the spectrum, from slow to stop, and it frees up some ram to run smoothly. But I can figure out how to reduce anything to get the software to perform without sluggish behavior. It demands so much on the computer, using it is not fun. I tried downloading the AA5SH RTL USB ZIPS from his site but when i unpack / unzip them they keep displaying corrupted. Tried several downloads and various unzip packages – same errors. Any one got a good copy they would share / send to me? The author contacted me and indicated the files were corrupt. He uploaded new ones and they worked Perfect! It keeps saying “nothing found” when searching for the usb radio card. Windows shows it fine in the device manager. Can anyone help? Thanks. Same here for v2.2 on x64 using a generic dongle with the r820t tuner. I’m going to start by falling back to 2.1 and if need be, forward to the 2.3 beta. Justin: which device, version and build are you getting this trouble with? It could be helpful to know. I was able to overcome this, and the solution seemed to be to keep the old libusb-1.0 when copying the libs over. If I have the chance, I’ll test this across the available v2.x builds. This software kluge-fix, copy over goofy dll’s is IMO, an untested piece of broken crudware. It is always too hard to figure out a developers mindset as to why they dont do the obvious stuff, wont include these cheap rtl-sdr usb very common devices in his software from the get go. its not a cludge fix!, it simply adds rtl usb to the devices dropbox and works exactly the same way as other sdr devices. worked for me this way, thank you. I installed my dongle as stated above and all went together well. I have saved all relevant software onto flash drive and will install on my other computer.